The Only Best Offer You Can Get..."
If YOU are one, then you're on the right place. If you please, let me guide you through it. WICKER FURNITURE - THE ORIGIN? Wicker furniture has evolved from the indigenous people's use of flexible plants, usually elongated (like rattan, bamboo, reed, palm leaves, etc. ), to create containers - such as baskets - for food; for gathering, storing, and even transporting goods. Some say that wicker furniture became popular in Egypt and passed to Rome and throughout Europe through international traders. Wicker then has become more of a high-end or luxurious artifact than a tool for collecting things or a container. You can find wicker products everywhere in various forms of arts and usages. Wicker is now a household name for a beautiful and luxurious chair, couch, bed, dining table, lamps, decors, among many. BUT, you may ask and order any manufacturer for a customize produce to suit your dream furniture... Yes, that really possible! Many have done it. I think, if you agree, that most wicker furnitures can be located in the living room. It's because people spend more time in that space and that they need a more comfortable and relaxing tool to sit or lie on. Ok, in Cebu, there are many manufacturers and in fact most of them create the product. 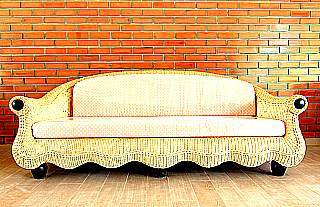 The picture below is a sample of how a living room wicker furniture looks like (NOTE: This product does not represent any of Cebu's wicker furniture manufacturer). I remember that rattan chairs are much better for table use since it doesn't scratch the floor nor make horrible noise when pulled away from the table. 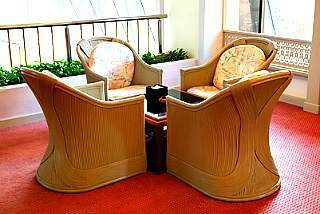 Some interesting designs of dining room wicker chairs are worth sharing here. You can find designs that project peoples' names and their personalities, such as Monroe, Audrey, Augustine, Kintaro, Yogi. Compared to the living room and kitchen wicker products, bed room wicker is not quite common. Most often, bed room wicker employ wicker as designs on the headboard of your bed. Yes, lamps look nice with some wicker designs that could lessen the intense emitting light from the bulb. Aside from the famous Cebu furniture other variety of wickers are also being created - such as artworks and decors - made from other materials. Most of artworks and decors are not wicker products themselves. They could be made of wood, metal, and other synthetic materials. However, you can also find wicker decors, especially some wall decorative arts. Accessories are also fun and interesting pieces. The accessories include: space divider, table decor, pedestals, and others. WHERE CAN I FIND THE CEBU WICKER FURNITURE? You may click any of the links below to see for yourself real products. To find more wicker furniture websites, you may click the 'Furniture' Navigation Bar on the top left hand side of this page. Now, go ahead and enjoy your visit. Thanks for the visit and get your ONE and ONLY UNIQUE furniture.